Violent protests against President Donald Trump and an America-First agenda appear to be backfiring: A new poll shows a majority of voters strongly disapprove of the Left’s attempts to stall Trump’s appointments and of liberals defending criminal illegal aliens. McLaughlin & Associates, which polled for Trump’s presidential campaign, found Trump’s approval rating has improved as the public’s mood on protesters has soured. A majority, or 51 percent, want Trump to move away from Obama’s policies, and 41 percent now think that the country is on the right track. Nearly half, or 48 percent, think it’s still on the wrong track, compared to 55 percent on Feb. 6 and 62 percent in January—which is a net increase of plus 27 percent, pollsters note. George Soros-linked protests seemed to anger voters. Asked if they support “billionaire George Soros financing left-wing organizations to pay people to protest against President Trump, and the left often using violent demonstrations on college campuses and in cities to stop pro-Trump, conservatives from speaking in public,” 70 percent of all voters disapproved, including 54 percent who strongly disapproved. A majority of liberals, or 51 percent, disapproved, along with 76 percent of independents. “It’s very clear that the paid protests, and certainly violent protests of the left are backfiring,” pollsters argued. Rallying on behalf of violent, foreign-born criminals is also deeply unpopular with voters. 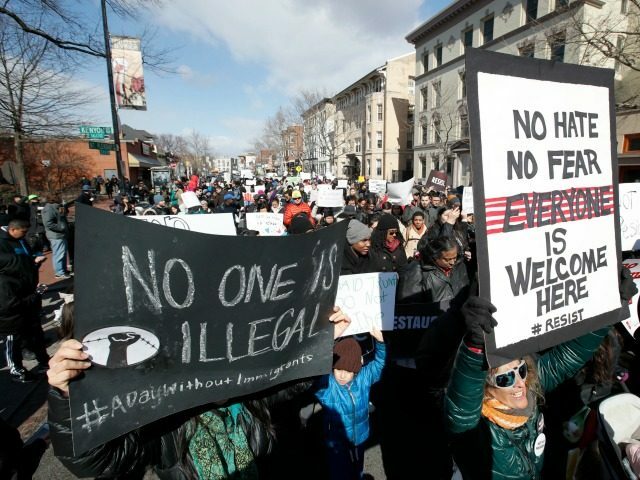 Asked what they thought of “protests by the left and Democrats to stop the deportation of illegal aliens who have been convicted of serious crimes in the United States to allow them to remain free in the United States,” 62 percent disapprove, including 64 percent of independents, 55 percent of Hispanics, and 44 percent of Democrats. “There is renewed hope in America and the majority of voters are supporting our president, while the Left shows how out of touch and failed their policies are,” he added. The poll, commissioned by Secure America Now, surveyed 1,000 likely voters from Feb. 15 to Feb. 20, with a margin of error of plus or minus 3.1 percentage points.